Desolation Sound is a coastal BC summer paradise … yet while many paradise seekers aim to explore this area in July and August to maximize their chances of perfect weather, there are endless reasons that a June – or even May – Desolation Sound escape can be just as rewarding. Whether you are joining a multi-day camping tour or spending a weekend at Cabana Desolation Eco resort, if you are kayaking with us before June 25th you stand to receive some juicy discounts. Our Off-Peak Group rates are our best rates, and you only need a group of 4 to receive this discount during these Off-Peak times. That means savings of up to $150 per person for camping tours and up to $330 per person for Cabana Desolation packages! Renters can also save money by kayaking earlier in the season, but please note the off-peak cut-off date for renting kayaks and equipment is May 15th. While hot summer days are perfect for swimming and snorkelling in Desolation Sound’s warm ocean waters, paddling in the heat of summer can be a brutal exercise. June days are typically a little cooler than July and August on the coast – around 4 degrees on average – or the difference between a comfortable day of activity outdoors and a gruelling sweat in the heat! From avoiding jostling in ferry lineups on the way up from the city to paddling into a serene wilderness, there’s a lot to be said about an early season kayak trip if you’re looking for peace and quiet. Like all BC coastal communities, Power River and Desolation Sound has its peak tourist season in July and August – particularly within two weeks either side of the August long weekend. A June visit to Desolation Sound is comparatively quiet. Sure, you get the odd sailboat or small yacht chugging down the inlets or on their way to Prideaux Haven, but it is far easier to get away from it all at this time of year and still enjoy nice long summer days. Those long, warm, early summer days are made for kayaking in British Columbia – it’s amazing how much you can fit into them! Up early with the sun as it warms the outside of your tent, drinking your morning coffee in peaceful silence, a lazy breakfast with family and friends, then into your kayaks for a full day of exploration and adventure. Back at camp in the afternoon, the sun is still high in the sky – plenty of time for swimming and snorkeling at camp – and then a cold drink and another relaxing meal with plenty of time to watch the sunset before twilight returns. The summer solstice is June 21st, and in Desolation Sound at this time of year the sun does not set until around 10pm. It peeks over the Coast Mountains in the morning usually before even the earliest risers in any camp group, meaning there are plenty of daylight hours to explore, or relax, in Desolation. What could be more satisfying after a long day of exercise than sitting back and warming your feet by the campfire? The last few summers in BC have been extremely hot and dry, and total campfire bans have been introduced well before the month of July. Early season paddling increases the chances of paddlers being able to safely and legally enjoy small campfires for warmth and atmosphere in the Desolation Sound area! Please note: Within the provincial parks, campfires are only permissible at sites that are equipped with specific fire rings – at this point these sites are Tenedos Bay and Grace Harbour. Campfires are however permissible at sites that lie outside park boundaries as long as their is no campfire ban in place. Please keep all fires small and manageable, and be sure to put them out completely before retiring to your tents or going out for a paddle. 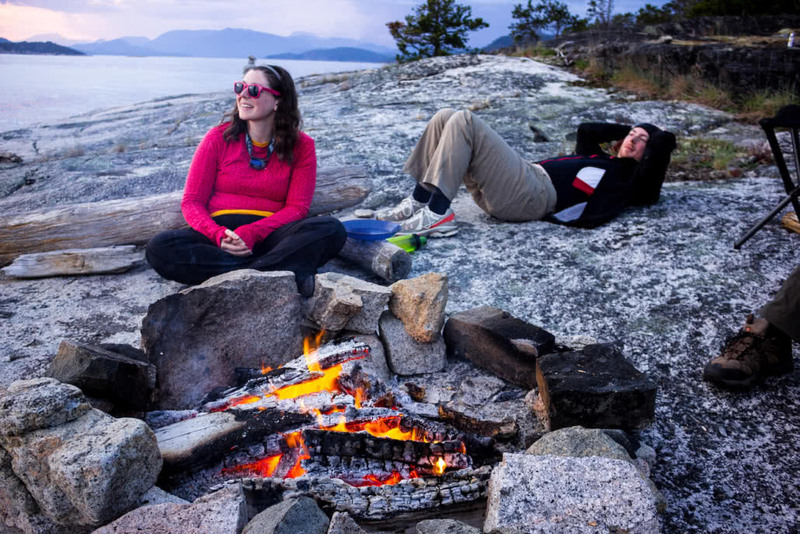 For guests on our guided trips, our private tenures outside the park boundaries mean that we can enjoy campfires in these early season months before any fire bans come into effect! Many birds, mammals and even invertebrates are migratory – from the long, gruelling journey of the big whales from breeding grounds to feeding grounds, to the relatively subtle shift of certain sea stars deeper in the water column due to the warm summer water – many animals move with the seasons. Aside from whales such as humpbacks, sea lions are far more likely to be encountered in May and early June before they head north or south to their rookeries. Sea cucumbers and sea stars such as the vermillion star tend to be found deeper in the intertidal zone during the summer. Bird life, too, shifts with the seasons. Loons, grebes and certain species of duck are far more common on saltwater during the spring – not to mention the colourful winter plumages of certain waterfowl that fade in the early summer months!